There has been a bottle of Johnnie Walker Red Label sitting in my Dad’s liquor cabinet since the mid 1990’s., so the ideal experiment for my “The Week I Turned 30” series would be to see how and if the Red Label has changed over the years. 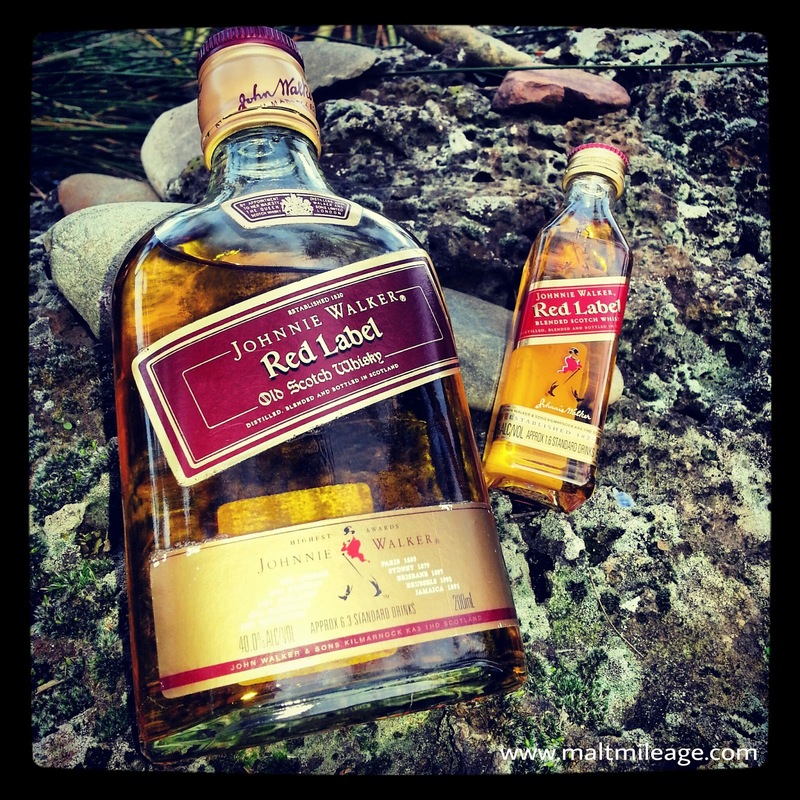 This post will parallel taste and compare the Johnnie Walker Red Label of the mid 90’s to the Red Label of today (purchased in June 2013). This experience was like smelling and tasting history; nosing and drinking a mid-90’s Red label and comparing it with a 2013 Red Label showed what whisky was actually like when I was too young to drink it and it also provides a glimpse into the evolution change in character of an iconic whisky: the Red Label. I struck out the word “evolution” to make a point, because I think the Red Label has taken a few steps backwards and become less complex and less “developed”. The difference between the mid-90’s Red Label and the Red Label purchased in June 2013 was evident on the first sniff, with the 2013 bottle releasing a strong new spirit stench under which the aroma of honeyed orchard fruit and the mild smell of licorice based produce (fennel, anise seed etc) shined. The mid-90’s Red Label was a lot more subtle, and did not have the same overpowering new spirit stench. This allowed honey drizzled peaches and apricot to shine on a bed of grain and some vanilla bean with the pierce of dry ethanol and tart blackberries that interacted with a bag of jelly beans! Therefore, the 2013 Red Label had the overpowering gust of new spirit that seemed to strangle the other character in the whisky. The more I nosed the mid-90’s Red Label, the more in became apparent that (in my opinion) the Red Label is no longer the beautiful Scotch it once was. It makes so much sense now, why the Red Label was everywhere while I was growing up; it was pretty good whisky and great value. While I enjoyed the mid-90’s Red Label very much, I did not enjoy the 2013 Red Label neat. Nose: This whisky has a beautiful and elegant nose that has a mostly gentle foundation of caramel, vanilla and dried fruit upon which glistening sugary honey, jelly bean, grain, dry ethanol and tart berry shine and provide a sharpness. The candied sweetness is diverse, like a bag of different coloured jelly beans. As the whisky rests the gooey caramel takes on the aroma of a chocolate praline with shards of crisp toffee. The slightest dry smoke also presents itself. Taste: An immediate wave of sweet orchard fruit merges with the grain as the sweetness intensifies into licorice based black jelly bean; a sweetness that then declines and vanishes into a dry – almost faintly grassy – smoke. Finish: The dry smokiness lingers with lolly-shop sweetness and a faint grassy earthiness (not “peaty”, more “earthy”). Nose: The stench of new spirit is immediately recogniseable. Within that gust of new spirit is some honeyed orchard fruit (plum and apricot in particular) with some boiled chestnut and wet dough. There are some licorice notes, though it is strangled by the smell of new spirit; the fennel and anise seed notes waft up very faintly only to be engulfed by the doughy new spirit. There is a shimmer of golden honey that develops as the whisky rests, and it shines brightly in the foreground. Taste: A sugary sweetness hits the palate with a surge of bitterness developing; an alcoholic bitterness that buzzes on the tongue but then recedes into a candied apricot and toffee apple finish. Finish: Bitter and sour grapes radiate on the tongue, with their acidic burn. There is a bitterness about the finish in this whisky that is oak driven and yet has all the hallmarks of immaturity; perhaps the combination of alcohol and some pretty aggressive casks. Yes I have found the red to be harsh and bitter to the point I cannot believe people actually buy it. Cheap I guess is the answer. I have had enough new make & young grains + malts to know saturated sweetness is where it is at but to have the bitterness and harsh old cask tangs loses me. I relate JW Red more to a home bench still quality than a experienced distillation process. Anyway regardless it is good to be able to match the versions up. A rare thing to do in general.